Welcome to the world of Pugs. You are about to discover that, once a Pug enters into your life, it changes forever. You are probably already intrigued by them; I know that I was when I first knew that I wanted one. They fascinated me; their funny flat faces, those big eyes, the curly tail and the amazing way they bustle about, so full of their own importance. They are beautiful and you will defend a Pug’s beauty forever. Once Pug had come to live with us he quickly gained complete control of my parents, my sister and five Labradors. We were hooked and he knew it. A Pug will soon find the weakest link amongst its humans and manipulate them, whether it is for food, games or for the most comfortable seat in the house and I know now that we should not have allowed that to happen. A Pug is small in size, enormous in personality, intelligent, affectionate and loves to be the centre of attention. They need human company, not to be left on their own for hours and, to be honest, need quite determined training which has to be a joint effort. I must warn you that they do cast their coats and they do snore. They are easy to groom; a daily brush and careful wiping of the overnose wrinkle, with a daily check on their eyes and ears. The breeder of your puppy should show you how to do this. Dental hygiene is best started from puppyhood and it is wise to keep an eye on the dog’s weight. Most Pugs enjoy their food; some to excess. 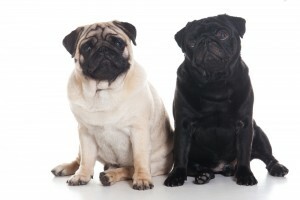 If you are interested in becoming the owner of a Pug, do take time to find a reputable breeder who understands the breed and will offer their experience and lifelong interest in your puppy. It is not always the first breeder or puppy that is right for you and time spent looking at puppies and making the right decision is never wasted. Responsible breeders will also want to know about your lifestyle and the home that you are offering to make sure that you are both suited. Most important of all you have to be certain that you are ready to have a puppy and be prepared for some change to your life when you become the owner of a dog whether it is a Pug or another breed. Once you own a Pug you will soon learn that there is “nothing quite like a Pug” – they are enchanting.